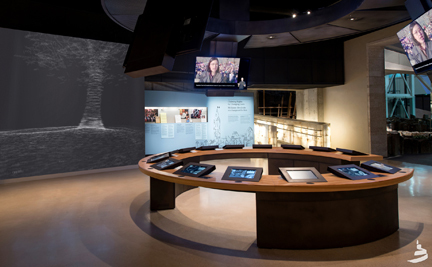 The Protecting Rights in Canada exhibit includes a series of interactive stations where visitors watch news clips about, and read arguments for and against, key Canadian court cases that have defined humans rights in Canada—often on very divisive issues. Visitors are then asked to “vote” for which side they think is correct. After everyone at the station has voted, the results are displayed alongside a running tally of all the ballots people who have cast at the exhibit before them. Museum voice: Spreading hatred of people based on social position or ethnic background is a crime under the Criminal Code of Canada. Alberta teacher James Keegstra believed the Holocaust was a hoax and that Jewish people conspire to control world finances and politics. He taught his beliefs in his classroom. In 1984, he was charged for spreading hatred. After making its way through the lower courts, Keegstra’s case went to the Supreme Court of Canada. His lawyers argued that the Canadian Charter of Rights and Freedoms protected his freedom of expression. Question #1: Should the law limit our freedom to express our thoughts, beliefs, ideas, customs and opinions? Archival news video clip #1: It was the first major test of Canada’s so-called ‘hate law’. Jim Keegstra was accused of denying the Holocaust and promoting anti-Semitic views in his classroom. Archival video clip #2: The way I see it is that teacher can go into a classroom now and say anything he pleases and there’ll be nothing anyone can do about it. Archival video clip #3: that Mr. Keegstra was putting forth a different point of view and that he was certainly entitled to do that. Question #2: Do laws that ban hate speech violate people’s freedom to express themselves? Archival video clip #4: I think all these people are believing in freedom of thought, expression, religion– they’re believing in freedom. Archival video clip #5: Freedom of speech to Jim Keegstra means exactly that–no limitations. No matter what the courts or politicians decide. Archival video clip #6: What we’re saying is, we recognize that there is appropriate limits upon freedom of speech and one of those appropriate limits is to suppress the willful promotion of hatred. Should freedom of expression be limited if what someone is saying threatens another person’s or a group’s right to equality? Archival video clip #7: In the end our Supreme Court says that in this particular instance, balancing all of the factors involved, that it is group rights…it is the rights of the community that takes precedence over the rights of the individual. Archival video clip #8: I have been spreading truth, facts…and everything. I’ll never agree that I spread hatred. This is a defeat for all Canadians. Archival video clip #9: This is strong blow against hate mongers in Canada that continue to disseminate that material. Archival video clip #10: It was the longest trial in Alberta’s history and the people in this community are now more anxious than ever to put it behind them. But the controversy surrounding Jim Keegstra and his right to free speech is far from over. Museum voice: Since the Keegstra case, the Supreme Court has further defined hate speech. The debate over what are reasonable limits to free speech and freedom of expression continues.